​I'm new to the game and just found your website. I want to develop good habits early on so I don't have to undo things later. What do you recommend I focus on so early in my pickleball 'career'? Barney T., Madison, Wisconsin. In my opinion, the most important thing to develop, by far, is a sense that pickleball is primarily about movement. The more agile you are on the court, the easier it will be to hit the ball effectively. If you visit our video archive, you'll see that we've made a lot of videos about movement: when at the kitchen, after returning serve, chasing lobs and even a recent one on what it is to have an athletic look. You can have the nicest swing in the world, but if you can't get to the ball in a balanced position, it won't do you much good. So, develop your overall athleticism. Practice changing directions, improve your balance, work on your reaction time. Get in to the habit of chasing the ball rather than reaching for it. I promise it will be worth the effort. 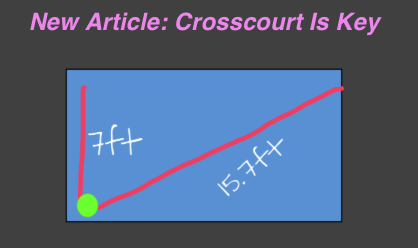 CLICK ABOVE TO READ MARK RENNESON'S ARTICLE RE CROSSCOURT.